Hala, a major new series of work by artist Steve Macleod, will be on show for the first time with Black Box Projects at Photo London 2018. Hala, drawn from the Arabic word for ‘aura’, comprises 30 large-scale photographs created in the United Arab Emirates, inspired by a collection of images by British explorer Sir Wilfred Thesiger. In 2008, Macleod stumbled across Thesiger’s photographs made on the behalf of the Middle East Anti Locust Unit following World War II. Taken in the Empty Quarter, known by the Beduoin as ‘Rub al Khali’, Thesiger had traversed one of the most desolate landscapes on the Arabian Peninsula. However, it was not the photographs alone which drew Macleod’s interest but a comment by Thesiger: ‘In the desert, I had found a freedom unattainable in civilisation’. What followed, after several years of trying to gain access to the region, was Macleod’s first series of work created outside of the UK. 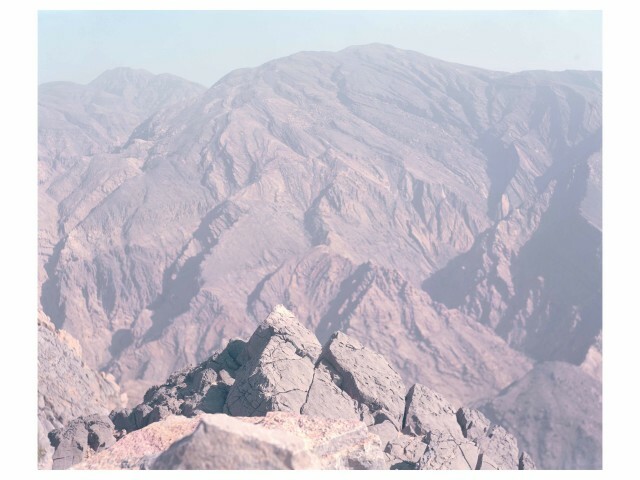 In 2015 he began shooting in the Al Hajar mountain range, a military exclusion zone which runs down the east of the Arabian Peninsula and is the highest and most inhospitable place in the region. It was here that Macleod discovered his own wilderness and a place to experience a true expression of nothingness. Working with his large-format camera, Macleod created this new series of landscapes, devoid of human presence, which embody his Pictorialist ideology. His photographs have always been characterised by landscape’s direct relationship to his own psychological state – translating emotion through the lens using colour, subject matter and light. The brooding and dark images of his recent work have been put aside in favour of this body of work that explores colour, light and a landscape of vast emptiness. The resulting pictures speak of redemption - a journey from desert lowlands to a stark and exposed summit - an exploration towards wellness and light. The works are archival inkjet prints on a highly textured watercolour paper, imbuing them with a tactile quality and a painterly style reminiscent of early Japanese watercolours. “Time stopped as I ventured through silent valley creeks and dry riverbeds. Fierce winds blew high up onto the mountain peaks as I experienced wide breath-taking vistas. I came across ancient Bedouin clan plots, low rock enclosures and pitches marked out on the ground; and small boulder caves; camouflaged and seemingly as ancient as the mountains themselves. Professor Steve Macleod is a landscape photographer. He travels extensively to undertake his practice and his work interprets landscape as a metaphor to describe historical and humanist subjects that connect us with the environment we inhabit. Represented exclusively by Black Box Projects in London, he exhibits internationally and his works are sought after and held in both private and public collections, including HRH the Duchess of Cambridge and HH Sheikha Fatima Bint Hazza' Al Nahyan. Macleod is also an educator - a regular lecturer and speaker on photography subjects he is a respected industry professional with twenty-five years experience. He is a Visiting Professor at UCS East Anglia; a Trustee of the Queen Elizabeth Scholarship Trust (QEST) and Lifetime member of Frontline Club in London. He also operates a successful mentorship programme for emerging artists. Black Box Projects specialises in contemporary photography and contemporary art that is created using photographic materials. The gallery is committed to working with artists who push the limits of traditional photographic practice. The gallery does not keep a permanent space, instead it arranges pop-up exhibitions in order to tailor the experience to the individual needs of the artist and the work.